All Nepal Football Association (ANFA) President Ganesh Thapa has clarified that the money which was given by Mohammed Bin Hammam to his son Gaurav Thapa was totally “personal”. International news agency, Associated Press (AP) on Friday evening revealed that the man in charge of Asian football, once a candidate to oust FIFA President Sepp Blatter as the sport’s worldwide leader, Mohamed Bin Hammam enriched himself and handed out hundreds of thousands of dollars to friends and relatives, including USD 100,000 to Gaurav Thapa, son of Ganesh Thapa. “It was completely personal”, Ganesh Thapa spoke to Kantipur TV this afternoon. “It was a loan deal and we have already fortified the loan deal”, Thapa said, “It is nothing to do with the AFC”. Meanwhile, GoalNepal.com has learned from the close source at AFC that the audit firm Pricewater has mentioned the payment (five installments) made by Hammam to Gaurav Thapa was from “Hammam’s personal account”. Thapa also told GoalNepal.com that the loan was taken in 2009 and was already been cleared. 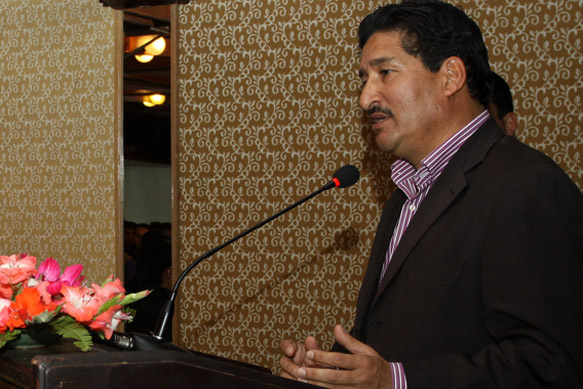 “This is nothing related to Nepalese football”, Thapa said, “This is totally personal”. “Gaurav (his son) is now in England for Olympic games”, Thapa questioned, “If he was guilty, how could he serve AFC in Olympics”. Mohamed bin Hammam, a 63-year-old Qatari whose life ban from football was overturned in a sports court earlier this week, is accused of using the Asian Football Confederation bank accounts to conduct his private affairs. It found he spent $700,000 from AFC coffers on himself and his family, including $100,000 for his wife, $10,000 on a Bulgari watch for himself and nearly $5,000 for his daughter’s cosmetic dentistry. AP reported that Gaurav Thapa, whose father heads the All Nepal Football Associaation (ANFA), received $100,000 while a Filipino football official Jose Mari Martinez received $60,000 and had $20,000 in hospital expenses paid. Another $50,000 went to an East Timorese football official Francisco Kalbuadi Lay, the audit found. Another $25,000 went for tuition expenses for a Bangladesh football federation spokesman and $20,000 to cover the cost of cancer treatment for the federation’s general secretary. Also, nearly $2,000 was spent by Bin Hammam to buy 14 shirts for Blatter and nearly $5,000 went toward the purchase of suits for Issa Hayatou, the CAF president.